ill it? Won’t it? They were the questions on classic scrambles fans’ lips when news broke traditional home of the British Bike Bonanza was being sold. In the end Adrian Moss found a suitable location not too far away from the original course and for the 2016 event Hailey Farm at Sapperton near Cirencester became the event’s new home. Plenty of action in the pre-60 class. 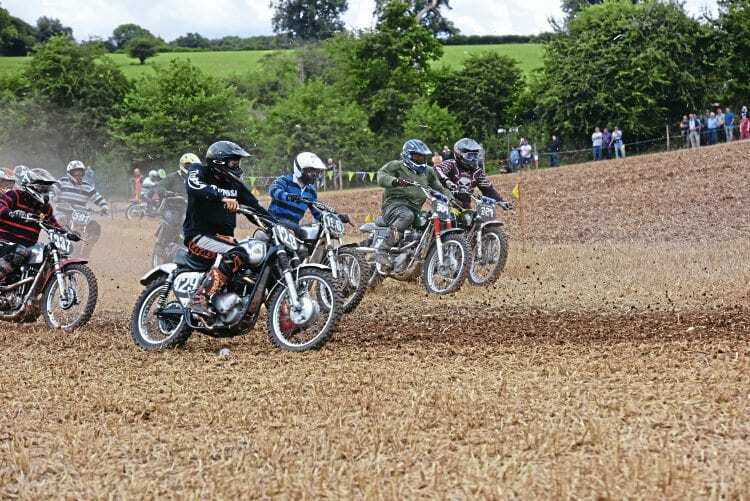 Though the venue changed there was still a trial on Saturday for which CDB has to thank Ken Wallington for the loan of an immaculate BSA B40 which puts the editor’s version to shame. The going was traditionally Cotswold though – thankfully reasonably dry so not too slippery. Given that Adrian Moss is unashamedly a fan of the bigger and pre-unit bikes in our scene it is perhaps no great revelation the Bonanza trial is designed around these bikes, and there were a good selection in action. Ponderosa Farm at Sallywood Park was always a brilliant and traditional course, and the Hailey Farm venue provided a different challenge… but most importantly of all, it meant the event could go ahead and the landowners could see we off-road riders are responsible people.